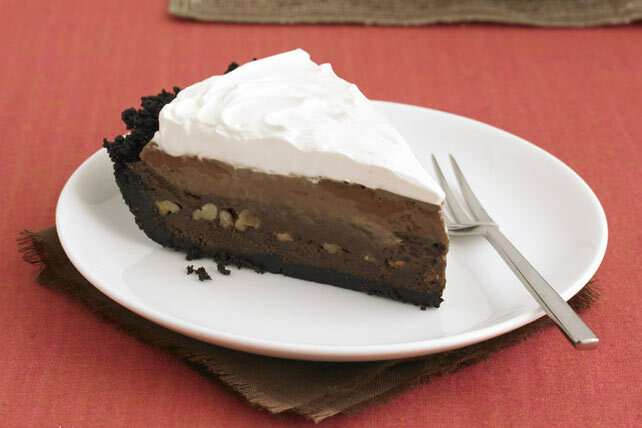 This creamy pie, featuring layers of BAKER’S Semi-Sweet Chocolate, JELL-O Chocolate Pudding and creamy COOL WHIP, is sure to make every chocolate lover weak at the knees. Mix baking crumbs and butter in 9-inch pie plate; press onto bottom and up side of pie plate. Mix melted chocolate and condensed milk until blended. Pour into crust; top with nuts. Beat pudding mixes and 2% milk with whisk 2 min. ; spoon 1-1/2 cups over nuts. Stir half the Cool Whip into remaining pudding; spread over pudding layer in crust. Cover with remaining Cool Whip. Savour a serving of this indulgent special-occasion dessert. And since one pie makes 10 servings, it's a perfect dessert to serve at your next party. Store leftover sweetened condensed milk in tightly covered storage container in refrigerator up to 1 week. Serve on top of fruit, with hot cooked oatmeal, or with your morning coffee instead of regular milk. Heat oven to 350°F. Spread nuts in single layer in shallow pan. Bake 5 to 7 min. or until lightly toasted, stirring occasionally.